A view of the Borg where Egill Skallagrimsson spent much of his life. The church stands over the site of his homestead. The Icelandic Sagas are some of the greatest works of literature ever devised. They tell the stories of the first Viking settlers on Iceland, based on real people, and written in the manner of Lord of the Rings (Tolkien in fact used the sagas as inspiration for his writings). One of my favorite of the Sagas is the Egill’s Saga which tells the story of Egill Skallagrimsson, a poet, warrior and serial killer; an Icelandic farmer who became the mortal enemy of the King of Norway and Northumbria, Erik Blood-Axe, and a man who would fight for the Saxons in the battle of Brunanburh, the battle that created England. The saga begins with the story of Egill’s grandfather, Kveldúlfr (meaning the “evening wolf”) in Norway circa 850 AD. Kveldúlfr is described as being a man bigger and stronger than any other, whose prowess in battle was so great he earned the reputation for being a hamrammr (or shape-shifter). His greatness earned him a great amount of money, land and fame. Kveldúlfr had two sons, Þórólfr (“Þ” pronounced as a “th”) and Skalla-Grimr (Egill’s father, whose name means “the bald Grim”). Like many of the Icelandic Sagas the family are forced to flee to Iceland because they got on the wrong side of the King of Norway. Kveldúlfr’s eldest son, Þórólfr, was made governor of North Norway but fell out with the King Harald who accused him of not sending the right amount of tribute. This altercation ended with King Harald setting fire to Þórólfr’s hall forcing him to run out at which point Harald cut him down. Following this Harald demanded that Skalla-Grimr come to his court to swear fealty. Skalla-Grimr came but would not swear to the King who had killed his brother. Kveldúlfr and Skalla-Grimr were thus forced to flee the Kings court and sailed away from Norway. Kveldúlfr died of illness during the voyage to Iceland. Skalla-Grimr settled as a farmer/blacksmith and had two sons, Egill (the protagonist) and Þórólfr(named after Skalla-Grimr’s dead brother). According to the Saga, Egill displays a gift for poetry and violence at an early age. At the age of three he is said to have composed his first poem and at the age of seven he killed another boy with an axe for cheating in some game they were playing. His rebellious nature and propensity for violence caused Egill to be ostracized by the rest of the Icelanders and he soon decided to return to Norway (with his brother Þórólfr) where he attended the court of the heir to the throne, Erik Blood-Axe. However, he soon stirred up trouble by composing a poem mocking the court bard, Atley. Atley took serious offence and tried to poison Egill. The bard naturally failed to poison Egill (thanks to protective runes Egill had carved on the cup which caused it to shatter in the presence of poison) who promptly ran him through with his sword, earning him the perpetual enmity of Erik (Atley was a kinsman to Erik Blood-Axe’s wife, Gunnhildr). Gunnhildr retaliated by sending her two brothers to kill Egill and his brother, Þórólfr (why she wants to kill Þórólfr is a mystery as he was a good friend of Erik Blood-Axe). Egill makes short work of the two brothers, killing them both and earning the eternal hatred of Gunnhildr. Egill’s curse soon came to fruition. Erik’s younger brother, Haakon (known as “the Good”) disputed the succession and, with the support of the English King Æthelstan, invaded Norway and overthrew Erik Blood-Axe who fled to the Kingdom of Northumbria (of which he was also King). 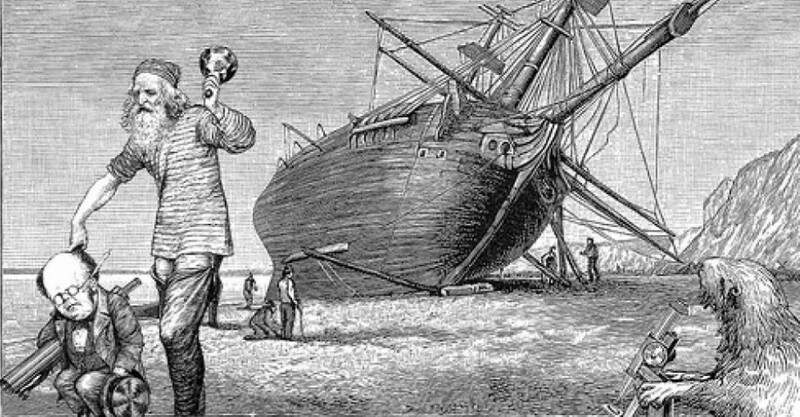 However, this did not work in Egill’s favour as he was shipwrecked in Northumbria shortly following these events. Upon learning that Erik was now ruling in Northumbria Egill sought out the house of an old friend, Arinbjorn. Arinbjorn convinced Egill to admit defeat and present himself before Erik and hope for mercy saying “now you must go and offer the king your head and embrace his foot. I will present your case to him.” Egill composed a poem for the occasion and recited the poem with Erik’s foot in his hand. The King, however, was not moved and declared that Egill’s crimes were too grave to be forgiven so easily. Sentenced to die in the morning Egill stayed up all night composing a “mighty poem” called the Höfuðlausn (head-ransom). In the morning, before he was to die he recited the poem for King Erik who was so moved by the quality of the poem that he decided to forgive Egill of his crimes and let him go. Following his release Egill went to the court of King Æthelstan in Winchester (along with his brother Þórólfr). Egill composed yet another epic poem for Æthelstan who rewarded him with two gold rings and “an expensive cloak worn by the King himself”. Egill and Þórólfr joined Æthelstan for the greatest battle of the age, Brunanburh, a battle of such size that it was known by the Saxons simply as “the Great Battle”. Egill and Þórólfr asked to be able to fight side-by-side but Æthelstan refused and placed them at different sections of the shield wall. Egill survived the great slaughter, however, Þórólfr was not so fortunate. Following the battle and the death of his brother, Egill returned to Iceland and settled on his father’s old farm, where he had spent his childhood. Egill spent the rest of his life in relative peace with his wife and five children, remaining a powerful force in Icelandic politics until his death at the age of eighty, shortly before the introduction of Catholicism to Iceland (his son Þorsteinn was one of the first converts). Shortly before his death Egill buried all his treasure near the town of Mosfellsbær (and in his last act of violence killed the servant who had helped him bury it). A Roman Catholic chapel was built over Egill’s homestead by his son Þorsteinn who exhumed his body and placed it near the altar. The church still stands (although it has since been rebuilt and is no longer Catholic). 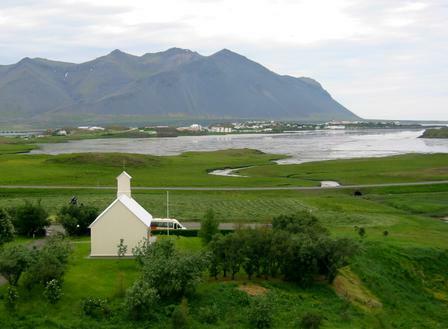 Today Iceland’s Myrar Clan claims descent from Egill Skallagrimsson.